Day two of Grand Duke Henri and Grand Duchess Maria-Teresa's state visit to Poland kicked off with the Poland-Luxembourg Economic Forum jointly organised Chambers of Commerce of the two countries as well as Luxembourg for Finance, Luxembourg for Business and Polish Information and Foreign Investment Agency which was attended by the Grand Duke. To open the forum, both the President of Poland as well as Grand Duke Henri held speeches. 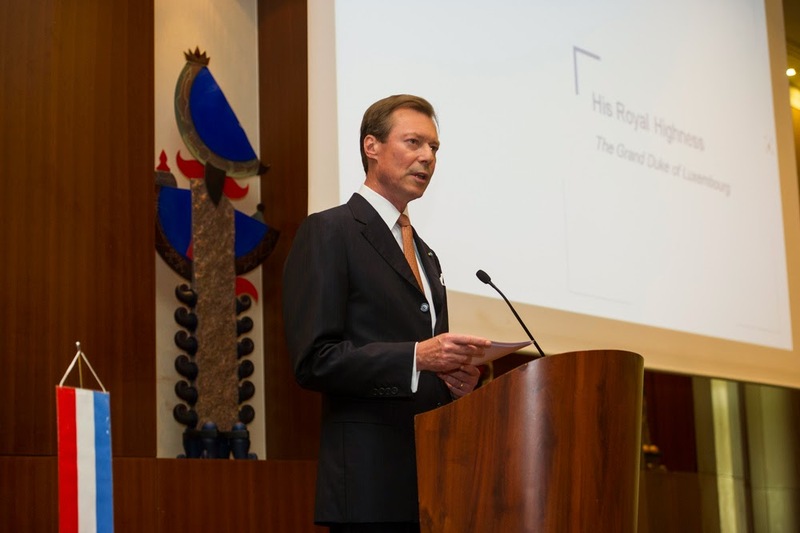 If you must, you can read the Grand Duke's entire speech here. During the course of the event, two cooperation agreements were signed between both country's Chambers of Commerce as well as all those other agencies I already mentioned above who organised the whole kit and kaboodle this morning. Afterwards, the Grand Duke and Grand Duchess as well as their Polish hosts, President Komorowski and his wife, visited the Warsaw Rising Museum, which was opened in July 2004. Organised by the Polish resistance Home Army and lasting 63 days, the Uprising was the largest single military effort taken by any European resistance movement during World War II. The Grand Ducal Couple commemorated the 200,000 killed during the course the Uprising at the Wall of Honour. 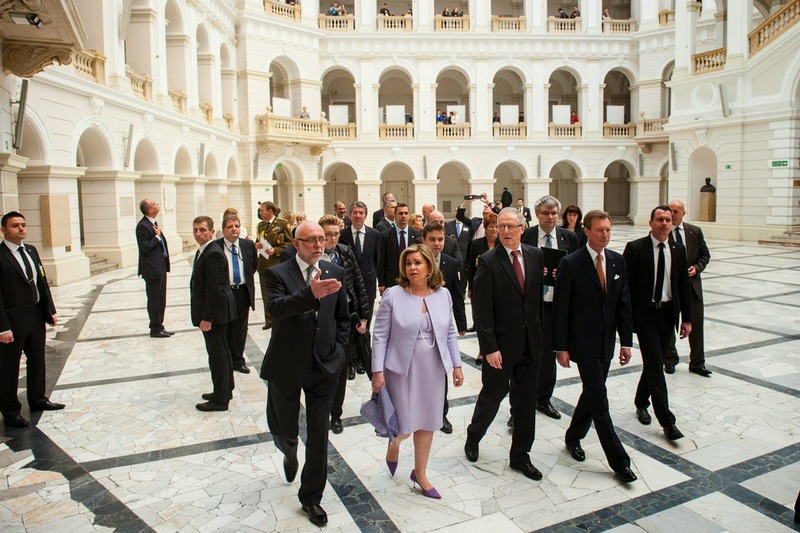 In the late hours of the morning, Grand Duke Henri and Grand Duchess Maria-Teresa also visited the Museum of the History of the Polish Jews built on the site of the Warsaw Ghetto, the largest ghetto in all of Nazi-occupied Europe. The museum was opened in April 2013 and currently functions as a cultural and educational centre. The actual core exhibition will open later this year though the Grand Duke and Grand Duchess were able to get a sneak peak of it today. After the visit to the museum, the Grand Ducal Couple laid a wreath of flowers and held a minute of silence at Warsaw Ghetto memorial. Next up on the agenda was a visit to the Warsaw University of Technology which is houses in quite a nice building. At the university, the Grand Duke and Grand Duchess, who was repeating an outfit from just a few days ago today, were given a presentation of the cooperation between the Warsaw University of Technology and the University of Luxembourg as well as that of the National Research Fund (FNR) of Luxembourg and that of Poland (NCBR) in the field of securing telecommunications. New cooperation agreements were also signed. In the early afternoon, Grand Duke Henri and Grand Duchess Maria-Teresa then got to do some sight-seeing. The Historic Centre of Warsaw is on the list of UNESCO World Heritage Sites and thus the parts of it were the go-to sights to see for the Grand Ducal Couple. Amongst others they viewed the Baroque style Royal Castle, the old fortifications and the Old Town Market. As it is tradition on the second day of a state visit, the Grand Ducal Couple hosted an event to thank their Polish hosts President Komorowski and his wife Anna for their hospitality. The dinner reception took place at the Old Orangery of the Łazienki Park and food by no other than Luxembourg's very own Michelin-starred chef Léa Linster was served. Before the actual eating began, Luxembourgish pianist Jean Muller gave a concert featuring the best of Frédéric Chopin ath the Old Orangery's wooden theatre. Pictures of the day are available on the website of the Polish President and Tageblatt. Wort and the government website have also both updated their galleries.